While I was working on P of EAA, I was lucky to get some in-depth review from Kyle Brown and Rachel Reinitz at some informal workshops at Kyle's office in Raleigh-Durham. During these sessions, we realized that a big gap in my work was asynchronous messaging systems. There are many gaps in my book, and I never intended it to be a complete collection of patterns for enterprise development. But the gap on asynchronous messaging is particularly important because we believe that asynchronous messaging will play an increasingly important role in enterprise software development, particularly in integration. Integration is important because applications cannot live isolated from each other. We need techniques that allow us to take applications that were never designed to interoperate and break down the stovepipes so we can gain a greater benefit than the individual applications can offer us. Various technologies have been around that promise to solve the integration puzzle. We all concluded that messaging is the technology that carries the greatest promise. The challenge we faced was to convey how to do messaging effectively. The biggest challenge in this is that messages are by their nature asynchronous, and there are significant differences in the design approaches that you use in an asynchronous world. I didn't have space, energy, or frankly the knowledge to cover this topic properly in P of EAA . But we came up with a better solution to this gap: find someone else who could. We hunted down Gregor and Bobby, and they took up the challenge. This book is the result. I'm delighted with the job that they have done. If you've already worked with messaging systems, this book will systematize much of the knowledge that you and others have already learned the hard way. 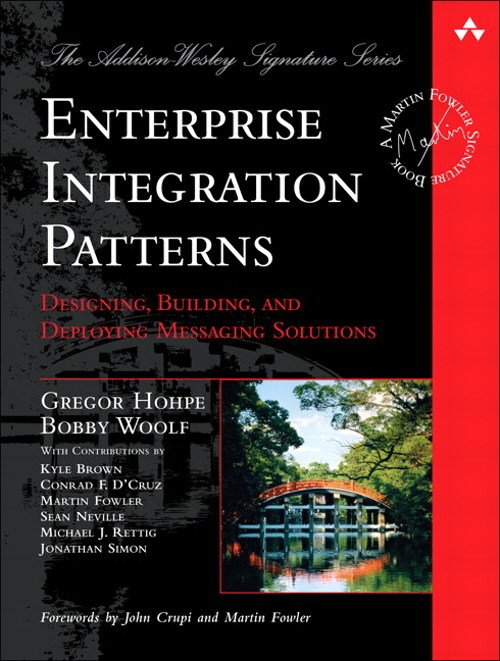 If you are about to work with messaging systems, this book will provide a foundation that will be invaluable no matter which messaging technology you have to work with. Gregor maintains a site with a lot more information on enterprise integration with messaging.